With the introduction of the Ultimate Edition Bethesda Softworks presents the definitive edition of Fallout: New Vegas. This complete package, which includes the Dead Money, Honest Hearts, Old World Blues and Lonesome Road add-on packs, allows you to experience everything that New Vegas has to offer. To sweeten the pot, you'll be armed with the latest cache of unique weapons, ammo types and recipes from the most recent add-on packs Courier's Stash and Gun Runners Arsenal. Whether you're a seasoned explorer of the Mojave or playing the game for the first time you will find there are more friends, and enemies, to make, more consequences to be responsible for and more opportunities to live in glory, or infamy, throughout the Wasteland. The choices you make will be as influential as ever. 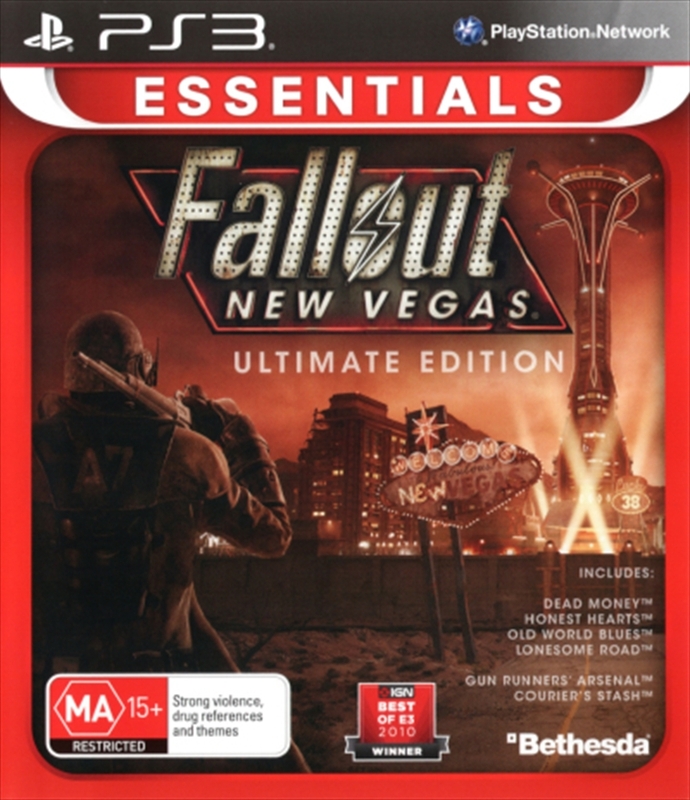 The Ultimate Edition includes all four mission expansion add-on packs-Dead Money, Honest Hearts, Old World Blues and Lonesome Road-along with two additional DLC packs-Courier's Stash and Gun Runners Arsenal-that increase the range of unique weapons, weapon mods, ammo types and recipes waiting to be uncovered in the vast Mojave Wasteland. New Vegas is more expansive than ever with the Sierra Madre Casino, Zion National Park, Big MT research crater and the treacherous Divide now open for the exploring. Each distinct area presents a fresh set of branching quests, remarkable personalities and more chances to play the Savior or Pariah to the natives of New Vegas. Each add-on pack adds to the mountain of armaments already at your disposal. Whether you're an in-your-face brawler or a long-range gunner, unique ballistic fists like the Two-Step Goodbye or a handy 10mm Sub-Machinegun such as the Sleepytime will ensure that the warmonger in you will flex its ammo-filled muscles. With each of the four main DLC packs, the maximum is increased by 5 levels, ultimately raising the ceiling to Level 50.